Umami Burger and Comedian Andy Samberg have teamed up to create “The Samberger,” which is an homage to the Chicago Dog, one of Andy Samberg’s favorite foods. The Samberger features Umami Burger’s signature beef patty topped with sport peppers, roasted tomatoes, chopped Umami dill pickles, a kombu relish, roasted garlic aioli, poppy seeds and yellow mustard on Umami Burger’s signature bun. You can try one at your nearest Umami Burger for $13. $1 from each burger will be donated to The Center for Early Intervention on Deafness (CEID) in Berkeley, California. Eating for a good cause! Now, that’s something I can get behind! The Samberger just recently made its debut on September 23rd, so go out and grab one while it’s still available! Where are all my Filipinos at? 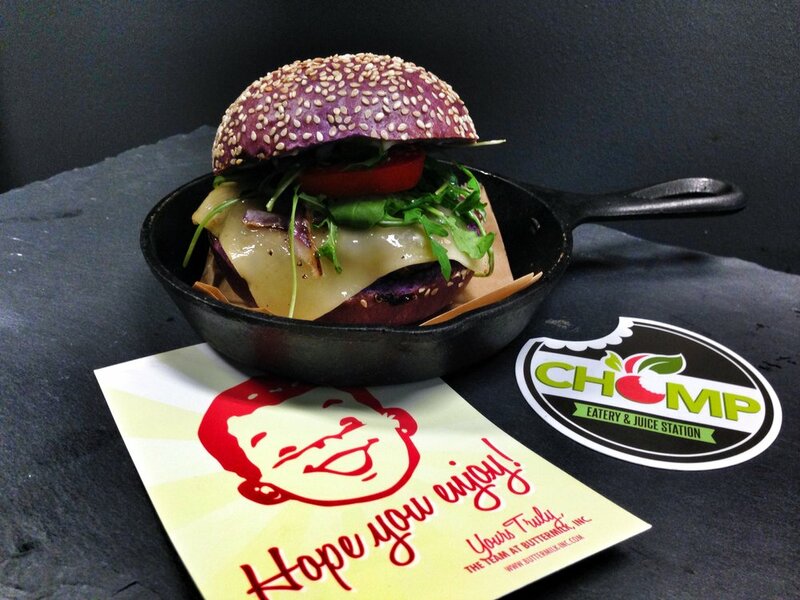 Another exciting debut coming in October is the Ube Burger from Chomp Eatery in Santa Monica. Ube is the Filipino name for purple yam, which is frequently used in Filipino and other Southeast Asian cuisines. The burger is grass-fed, has arugula, tomatoes, Swiss Cheese, truffle aioli, red onions, all slathered on a Ube Brioche Bun. I can’t wait! I love how purple the bun is. I love ube! I know this will be my new go-to burger! Another specialty coming also from Chomp Eatery is the Black Pretzel Burger, which is a Halloween themed specialty they are making. The Black Burger is made with USDA 100% angus beef, arugula, tomatoes, infused mustard, homemade mayo, pickles, red onions. The Black Burger is a speciality for Halloween and will be making its debut in October. Are you drooling yet? Followers of my blog probably know that I’m a big fan of Chomp Eatery. What I love about going to Chomp Eatery is how healthy and innovative the eatery is without sacrificing taste. They don’t use trans-fat oils or refined sugar. You need to try their pressed juices if you haven’t already! The owners believe that you should be able to enjoy a full meal and feel good about oneself after instead of slumping into a food coma. That’s something I definitely get behind!